Discussion in 'Thumpers' started by Sock Monkey, Apr 7, 2008. How you think it held up in Florida? Better than a Drz in that sand? A DRZ might have been a little better, the sand really hit the power of the WR pretty hard. It spent a large majority of the time in the sand at full throttle. The DRZs I've ridden handle sand similarly to your XR650l. A bit top heavy with soft suspension makes them wallow a bit but the added power makes getting the bike up to speed in sand a bit easier than on the wrr. N8, Ginger Beard and FLICKIT like this. I like your POV on your camera. What camera are you using, what's the settings (wide, super wide), and where's your mounting location? Ouch, that's what I was picturing... How deep is the hole? could you get away with running a bottoming tap in there and then use a longer bolt? I spent the last couple days riding around Colorado. Fall is in full swing here. I managed to break my frame where the kickstand mounts by catching it on a rock while cornering. Is anyone using an aftermarket kickstand that does not use the factory mounts? the kickstand part of the casting is replaceable according to the unit for sale on -> flea bay <- . Maybe a bike scrap yard in your area has one minus the parts you already have? Take another look at Yinz's picture. The part in the FleaBay link is the part that ripped off. The cast part in the picture is the frame casting. Wanaka, New Zealand, ....What Trip!!! Yinzer Moto, on your engine steel subframe just norh of the peg do you have a stress fracture at the edge of the weld where the paint has gone on holiday? MudDodger, wylie348, N8 and 7 others like this. 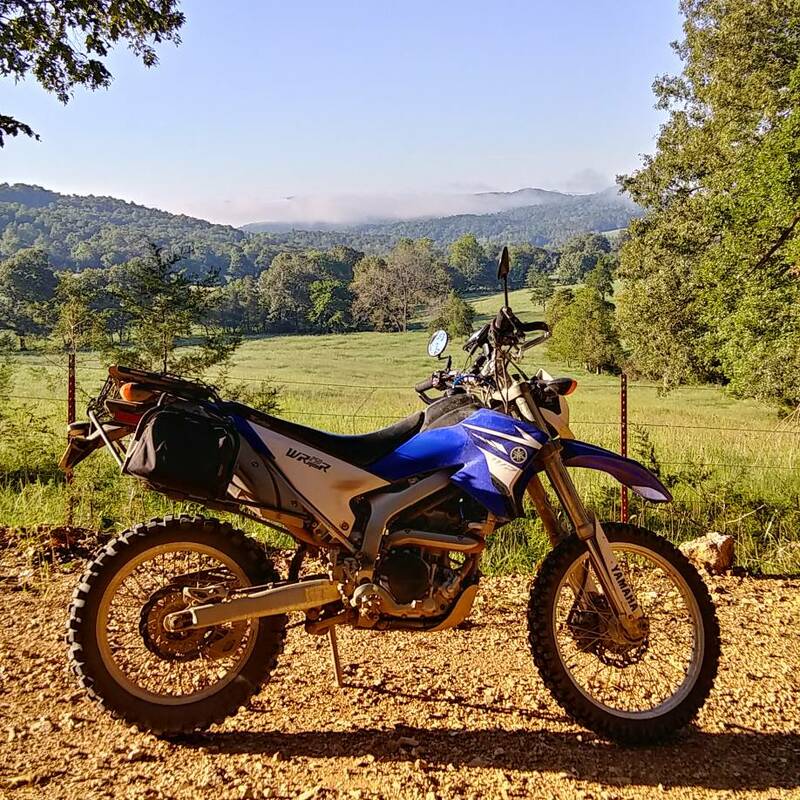 Went riding in superb weather in NW Arkansas! MudDodger, Plebeian, N8 and 5 others like this. I am running a GoPro session under my helmet visor, so that it can not get caught on branches. I’d have to look at it for the exact settingings. I could put a longer bolt in there but I doubt it would last very long without support. One light hit would have it ripped back. I see what you are talking about in the photo, but I doubt it is anything. It is probably weird light. ACR, Bitingdog, mo_rider and 1 other person like this. Damn good idea, you people with the backwards swirling toilets, really can come up with some good stuff! I am not real good at AL welding, I’d much rather weld steel. I could actually make that tomorrow. I am currently on the other side of the country, away from my garage and it would be nice to have a kickstand. Dirtleg and FLICKIT like this. Lucky. It rained all weekend in the central part of the state. Gezz an Ozzie with a good idea, you from Kiwiland bruh ??? ... and yes that is a great idea to spread the load. Now 99% of tyres step straight up to a 140, is this too bigger hoop to stick on the back of these wee girls?, I like the Motoz as it has the wear bar which makes for a good long distance travel tyre. Next option is Golden Tyre T201 or heidenau etc however any good suggestions welcome, don't need full knob on the back, want something a bit gruntier than the stock TW. New York is a beautiful state. I'd love to spend more time up here. Currently at a diner in Somerset PA. Going to try and roll east of this storm and head towards Roanoke VA by tonight... This poor bike. scarygary, Migyver, max384 and 11 others like this. N8 I prefer my pumpkin with a blue & white mask. Good thing you weren't riding a KTM. Prolly woulda broke in half and burst into flames. mf13368, NJDualsporter and Yinzer Moto like this.